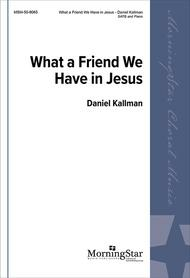 What a Friend We Have in Jesus composed by Daniel Kallman. For SATB choir and piano. Spiritual, Prayer. Medium. Octavo. Published by MorningStar Music Publishers (MN.50-9065).Spiritual. Standard text and tune recast in sweet, delicate, Gospel-style setting-well-suited for this hymn. Independent accompaniment. Introduction, interludes between stanzas, coda for solo piano offer lovely reflective moments to meditate on the beauty of this timeless text about prayer. Some bass divisi. What A Friend We Have In Jesus by Mahalia Jackson, Daniel O'Donnell, and Joseph M. Scriven. For piano, voice, and guitar (chords only). Christian; Gospel; Hymn; Traditional. 4 pages. 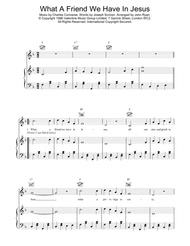 Published by Hal Leonard - Digital Sheet Music (HX.13537).About Digital Print Sheet MusicDigital Print is printable sheet music available anytime, anywhere. Just purchase, print and play! View your online sheet music at home, school, work or anywhere you have a computer connected to the Internet. Use our iPad app to view your digital sheet music on the go. With Digital Print, you can print your digital sheet music immediately after purchase, or wait until its convenient. And our software installation is easy - we'll guide you through the simple steps to make sure you have Adobe Flash Player, Adobe AIR and the Sheet Music Plus AIR application.